Toho, 1966.07.31, Color, 88 or 93mins. Plot: The cell division of Frankenstein makes two gigantic monsters. One is Sanda, Another is Gaira. 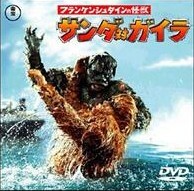 Follows: "Frankenstein tai chitei kaijuu Baragon"